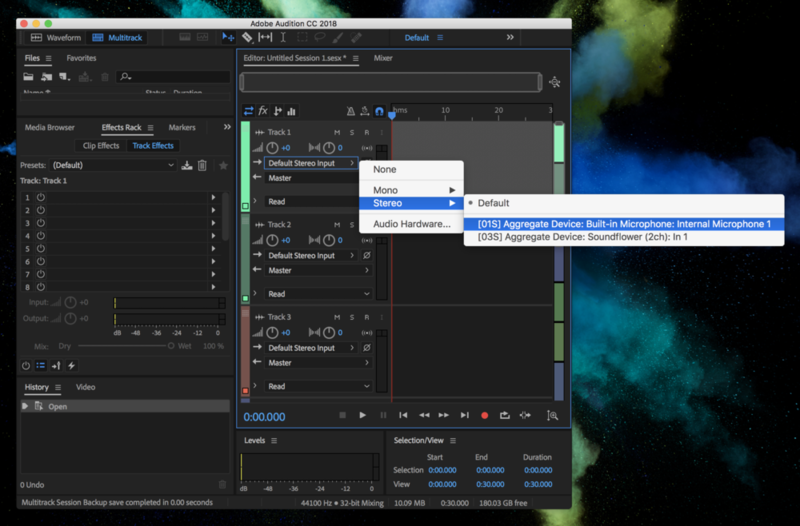 Capturing multiple audio streams simultaneously while recording a podcast is surprisingly difficult, making it necessary to rely on third-party software. For MacOS you have premium options such as Audio Hijack and Loopback Audio (both by Rogue Amoeba), or in some cases you can use the open-source Soundflower application together with a MacOS aggregate device to achieve the desired effect. Soundflower effectively gives your Macbook a new digital audio device which acts as both an input and an output. To capture soundboard audio, we send audio from the Podcast Soundboard application to Soundflower by setting it as the output device in Podcast Soundboard settings. We can then set the Soundflower device as an input to any recording software such as Audacity or Adobe Audition, which will successfully record the soundboard audio. There is another problem to solve however, since most recording software (including Audacity and Audition) only allows one input device to be set at a time. This is where the MacOS aggregate device becomes handy. Aggregate devices are virtual devices we can add natively to MacOS through the pre-installed Audio MIDI Setup application. Effectively, they allow us to combine multiple audio input/output devices into one. So what we'll do is combine the Soundflower device with the Built-in Microphone (or whatever microphone you're using), so we can record them simultaneously as required. First, install Soundflower from its official Github page: https://github.com/mattingalls/Soundflower. At the time of writing, the most recent version is 2.0b2 which can be downloaded from: https://github.com/mattingalls/Soundflower/releases/tag/2.0b2. Download the DMG file, open it, and run Soundflower.pkg. Your Macbook will likely complain that it's signed by an unidentified developer; to circumvent this, open System Settings, enter the Security and Privacy section, and you should see a bit of text referring to Soundflower.pkg, and a button to Open Anyway. Hit that and follow the instructions in the installer. When installation is completed, the only thing you'll notice is that your Macbook has two new audio devices: Soundflower (2ch) and Soundflower (64ch). With that, the Soundflower setup is complete. To create an aggregate device, first find and launch the Audio MIDI Setup application. By default you can find it under Utilities in your application directory, or you could use a spotlight search. With that open, hit the + in the bottom left corner and hit Create Aggregate Device. Now simply check your microphone and the Soundflower (2ch) input on the right. Now it's time to set up our applications. Launch Podcast Soundboard, head to the settings tab, and select Soundflower (2ch) as the output device. With that, we're ready to configure our recording applications. Open up audacity and select Aggregate Device as your input. Then you need to choose which channels to record; it took me trial-and-error to select the right channels, but on my laptop Audacity called all four channels at once 4. To monitor audio as it plays enable Software Playthrough (on/off) under Transport on the MacOS menu bar. Unfortunately, I find Audacity software playthrough to be somewhat delayed. Also, some users may wish to monitor the Soundboard, but not their microphone (especially if the playback's delayed). 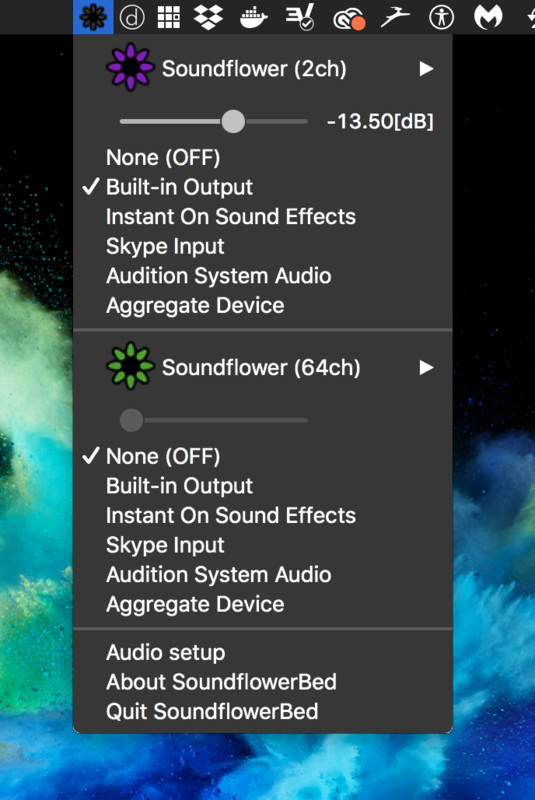 Fortunately there's an application called SoundflowerBed which, when running, gives us an option to monitor Soundflower audio through any device we like. You can download SoundflowerBed from the releases page of its Github repository: https://github.com/mLupine/SoundflowerBed/releases. The SoundflowerBed application is officially retired, but still works fine at the time of writing. According to the maintainer of Soundflower, a replacement is in the works. Launch Adobe Audition, create a new session with CMD+N, and open up the Audio Hardware panel. From there, select our Aggregate Device as the default input device. Arm these tracks to record, and by default they'll be monitored to your master output device. Mute your microphone track if you don't want to hear yourself, and you're good to go! You should now be all set up to record both Soundboard audio and your microphone input at the same time.